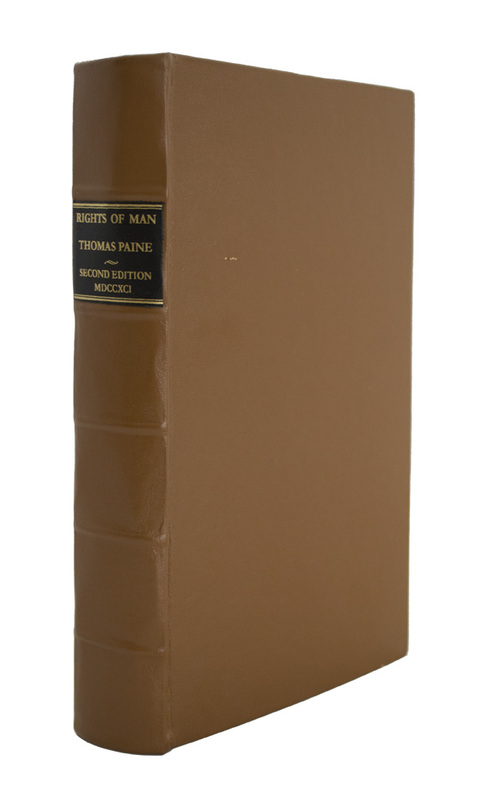 Rare First Edition of Second Part of "Rights of Man"
PAINE, Thomas. Rights of Man. Part the Second. Combining Principle and Practice. [With] Part I, later edition. London: Printed for J.S. Jordon , 1792. 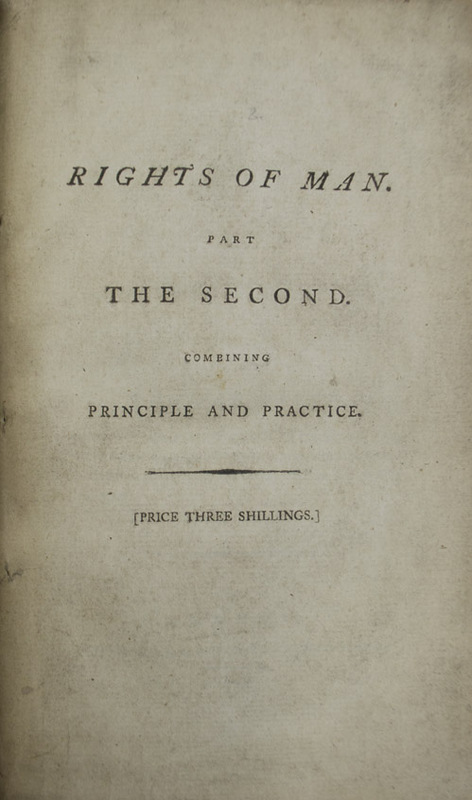 First edition of the rare second part of Paine's Right of Man. Octavo (8 1/2 x 5 3/8 inches; 215 x 135 mm). xv, [1, contents], -178 pp. With half-title. Half-title with price of "Three Shillings." We could find only one copy on ABPC, and that same copy on Rare Book Hub. In 2015, a first edition of part I sold for £161,000, with the second part in a later edition. Paine, Thomas. Rights of Man. Being an Answer to Mr. Burke's Attack on the French Revolution. Second edition. London: Printed for J.S. Jordan, 1791. Second edition (The first edition is extremely rare). With "Jordan" imprint and added preface. Octavo, in fours. x, 8-171, [1, blank] pp. Half-title present. Both volumes bound together in modern faux leather. Black morocco spine label. With original stab-marks still present and visible in both volumes. Part I with leaves M3 & M4 remargined at fore-edge and first blank, half-title and title-page bound on stubs. Part II with a tiny half-inch closed tear repaired at the bottom blank margin of C2. Overall a very good copy of both parts. 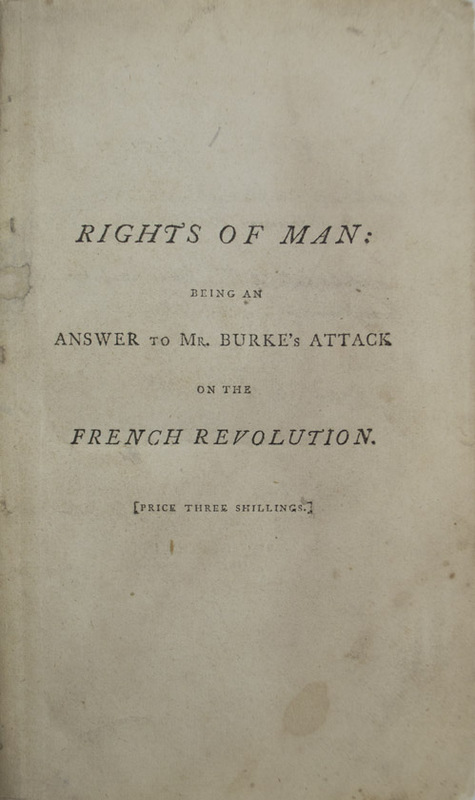 Originally published in 1791 as a reply to Edmund Burke's Reflections on the French Revolution, as a vindication of the French Revolution, and as a critique of the British system of government, Rights of Man is unquestionably one of the great classics on the subject of democracy. Paine created a language of modern politics that brought important issues to the common man and the working classes. Employing direct, vehement prose, Paine defended popular rights, national independence, revolutionary war, and economic growth-all of which were considered, at the time, to be dangerous and even seditious issues. 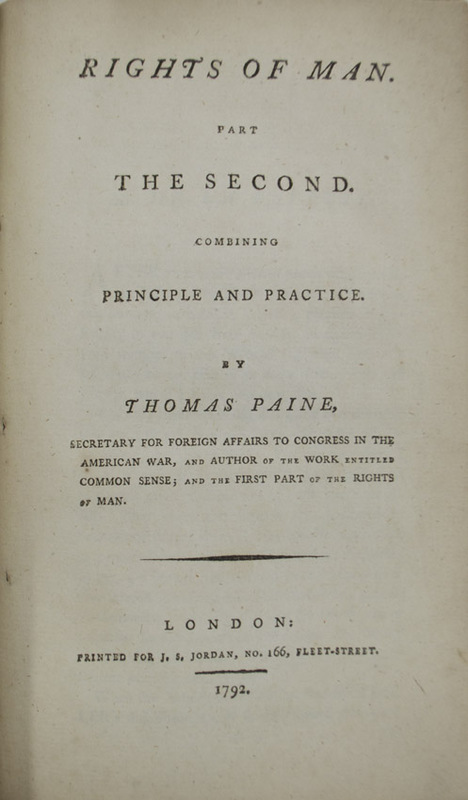 The second part constitutes Paine's revolutionary advocacy of representative government, and an appeal to the English to overthrow their monarchy. It was so popular with English radicals that 200,000 copies were sold by 1793. 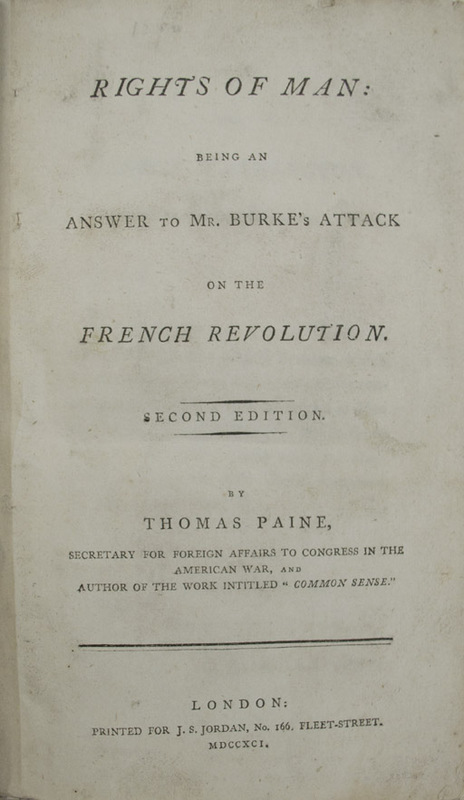 Regarding Part I: "The attack on the French Revolution, which Burke had made in his Reflections on the Revolution in France, infuriated Paine, who was chagrined by these statements coming from his former friend, the great liberal. He rushed into print with his even more celebrated answer, The Rights of Man. Paine hope this book would do for England what his Common Sense had done for America. He appropriately dedicated it to George Washington and published it on Washington's birthday, February 22, 1791. However, the publisher, J. Johnson, frightened by Government agents, suppressed it on the day of publication. Only a few copies, distributed prior to publication, have survived' (Gimbel). Gimbel. Howes. Printing and the Mind of Man 241.